Sciatica due to Herniated Disc - A history of back related leg symptoms with physiologic evidence of nerve root compromise by very strong obvious physical examination or EMG (95% at L5 or S1 level) and concordant with corresponding obvious anatomic verification on MRI or Myelogram are indications to consider surgical decompression. Theres seems to be no real advantage to surgery after a year or two other than speeding recovery if the findings are strongly concordant and there are no technical complications. The procedure removes the offending disc and any loose nuclear material within the disc (discectomy) usually through hemi-laminotomy (widening the opening between the lamina). However, if the patient can function with less than 3+ EMG findings, then without surgery recovery commonly occurs within a few months with a recurrent episode rate of about 60% in the next few years. Surgically decompressing the neural contents can reduce the symptom recurrence rate to about 10% depending upon the balance between conditioning for activity and the physical demands made on the back by the activity. Additionally, for manual workers fewer days of work are missed due to back problems during the first 4 years following surgery. Thereafter, there seems no difference. Disk surgery to decompress nerve roots is a luxury for speeding recovery when there are very strong findings. Generally, the stronger the concurrent findings, the more assured is a reasonable surgical recovery. A risk of recurrence of herniated disc at the same level is between two and four percent. Important point, surgery does not make the back 18 years of age again. Limitations are minimized by muscular conditioning relative to what the back is asked to do. Neuroclaudication from Spinal Stenosis - Patient history usually reveals a slow gradual decreasing activity tolerance especially with walking (neuroclaudication) and standing (related to extension of the lumbar spine). Symptoms in the back with leg and/or foot symptoms in the patient with spinal stenosis are relieved by flexion of the lumbar spine, which decreases the ligamentous enfolding crimping the intradural neural contents. Occurring before age 60, consider screening for diabetes or other general metabolic problems. Most patients have a history of at least intermittent symptoms for months before seeking medical care. Physical examination tends to be unimpressive. Patients are commonly without straight leg raise sciatic tension signs and weakness, atrophy as well as diminished reflexes can be subtle and symmetrical. Predictors of stenosis are limited. EMG changes tend to be minimal due to the gradual nature of the compression. EMG can help in differentiating new from old changes when acute findings are present (sharps, fibs). SEP's aid surgical planning by identifying levels of compromise in combination with EMG changes to guide which nerve root foramen need special attention during surgical decompression. Anatomic studies either MRI or Myelo-CT scan, provide verification of the structural need of Laminectomy for central decompression. Foraminal decompression commonly requires removal of partial anterior facetectomy and perhaps partial removal of the inferior pedicle. Surgical decompression is not preventative and should be performed only when the patient feels compromised enough by the walking limitations to undertake the risks. Bowel & bladder compromise is an emergency indication for decompression. Those who respond to surgery tend to be those the most limited in walking distance (neuroclaudication < 300 yards). 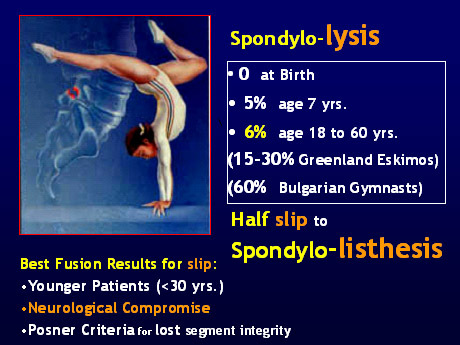 Segmental fusion may be considered if there is accompanying Spondylolisthesis (degenerative slip) with motion. 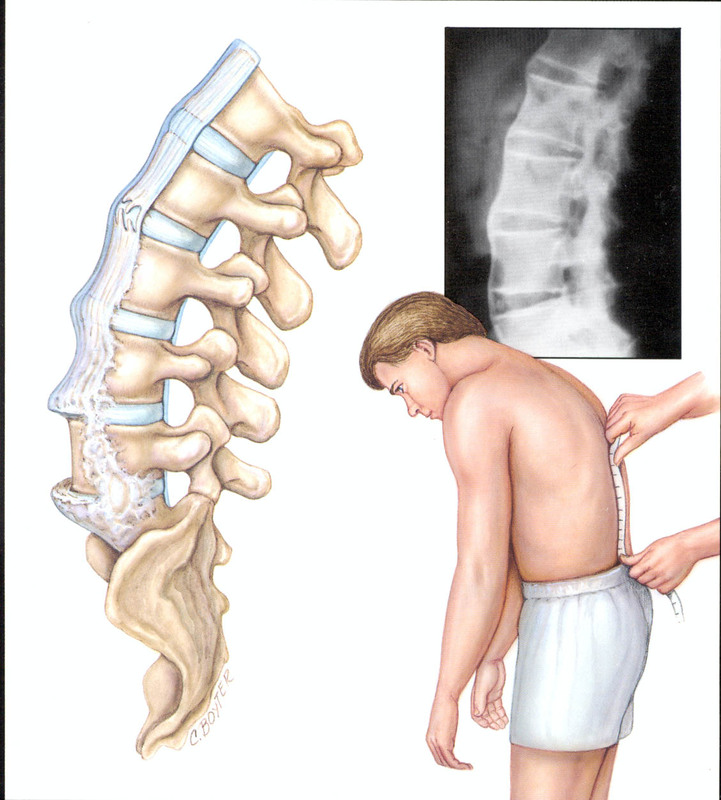 Spondylolisthesis - In the United States 3.5% of adults have slippage of either L4 vertebra on L5 or L5 vertebra on the sacrum due to bony disruption between the facets (spondylolysis) early in life. When one vertebra slips forward more than 25% of the anterior-posterior diameter of the vertebrae below, the nerves at the involved level can become compromised. The limb findings on neurological exam and EMG changes are commonly subtler than with a herniated disc especially when bilateral. Surgical decompression is similar to that for Spinal Stenosis, with fusion usually required as the disc tends not to be sufficiently aged and stable as the stiffer older discs found in spinal stenosis. Thus, there is a greater chance of further slip with decompression, a phenomenon commonly attributable as well to younger discs and underdeveloped facet joints. Best fusion results are in young adults with Posner criteria for instability. Usually with fusion, the younger the patient (less 30 years of age), the better the result. A tricky diagnostic dilemma can develop when vague natural back symptoms occur in the patient with a spondylolisthesis. A slip of less than 25% and even up to 50% may not cause more back trouble during the working years than no slip at all. Since 25-40% of back patients have accompanying leg symptoms, a slip noticed on x-ray can lead to the unverified mis-diagnosis of a minor long-standing slip being the cause of the symptoms. 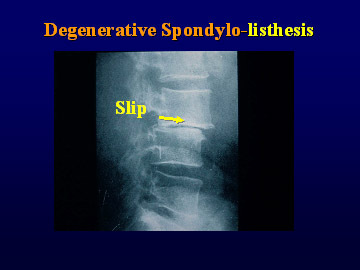 Later in life, the slip can complicate elderly spinal stenosis but even then most slipped segments stiffen leaving little of the residual motion that requires fusion except to augment decompression for spinal stensis when motion is present. Medical Arthritis (Sero-negative Spondyloarthopathy - Not "Rheumatoid arthritis") consists of Ankylosing Spondylitis, Reiter's' Syndrome, Psoriatic Spondylitis with related expressions of spinal symptoms. They sharing association with HLA-B27 serology including enteropathies, inflammatory bowel disease. Except for Psoriatic arthritis, it mostly occurs in men, with onset at age 20-40. These tend to be mult-isystem diseases that requires medical observation and responses to combination therapies to maximize patient functioning. Look for back symptoms lasting longer than three months, worse in the morning (especially stiffness) than evening, improved by mild activity, and taking more than ninety minutes to get as good as they get for the day (Calin, 1975). Rudwaleit et al.`06 further refined clues to include alternating buttock pain, and awakening during the second part of the night due to back pain. Criteria for diagnosing early ankylosing spondylitis prior to the development of radiographic abnormalities (identifiable in SI joints on AP of pelvis or oblique views) is still evolving (Rudwaleit et al.`05). Tc-99 bone scan ratios of sacroiliac joints-sacrum can aid early detection though not alone diagnostic other than to rule out active sacroilitis that may also be burned out late in the course and be negative (See SI Bone Scan). Once stiff and brittle, minor trauma can cause fractures. Associated dangers also include aortic aneurysm that should be sought in any examination or work-up for abdominal pain. Late spontaneous sacroiliac fusion, squaring of the vertebral bodies on lateral views or more severe expression in a small minority of affected patients with forme frust syndesmophytes flowing like wax along the longitudinal ligaments restricting extension and stiffening the spine in thoracic kyphosis and cervical flexed position. Stability is the rule for the spine. 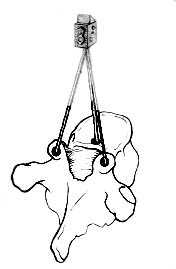 A tripod arrangement of the spine made up of the disk and facet joints provide inherent stability to the young spine with the disk being stable construct to withstand compression while the facets guide the spines limited but complex motion. Aging of the of a spinal segment tends to eventually increase the inherent stability rather than become unstable. Early disc height loss would expected to cause laxity in the longitudinal ligaments that in most cases eventually are stabilized by osteophyte formation and a jamming impact of the tripod arrangement with a mechanical alteration of any one of the three joints on the others. Thus, reduced motion is expected unless in the early stages the segment may become victim of stress shielding where the segment takes up increased forces and allows a cycle of allowing increased stiffness in either more or less aged adjacent stiffer segments. On the right is the arrangement of the spinal joints. On left is a depiction of Stress shielding. At first stresses bends the wire uniformly until there is a weak spot (where it will eventually break). Once weakened the segment takes all the stress, shielding any bending stresses elsewhere. As with fatiguing a wire to break it, until a weak spot in some cases develops the spine bends uniformly with the full length sharing the load. Finally a weak spot develops. Then the weak spot, being more lax, takes up more and more of the stress and shields the remaining stiffer areas from having to bend. Usually the bodies response to abnormal motion is to stabilize it and only in rare cases do they ever meet the Posner Criteria that predict a reasonable outcome with fusion. Thus, we can test for stress shielding of the spine with two lateral radiographs centered at the site of possible pathologically increased motion (weak spot or hyper-mobile segment). By superimposing the two as demonstrated below, the translation and angular motion can be evaluated and correlated to similar principles as determining the weak spot in a wire. This provides us with at least some semblance of objectivity in evaluating stability though we have only week clinical correlation without the presence of fracture or dislocation. The "Posner Criteria" techniques in the following figures are to evaluate potential long-standing instability. CAUTION:ONLY SPINE SPECIALISTS SHOULD CONSIDER USING SIMILAR TECHNIQUES FOR SIGNIFICANT ACUTE TRAUMA! Attempting to secure hyper-flexion and hyper-extension views can be dangerous with possible acute dislocation or severe fracture.